In July 2018, I brought home a new Border Collie/Aussie mix puppy, now named Murphy. With Murphy added to my house hold, I decided to create a page, dedicated to help prepare new puppy owners for the journey ahead of them, and (hopefully) ensure both owner and puppy to get the best start possible. Preparation is key in order to build a great life together and should start BEFORE you even get the puppy home. Especially pay attention to the critical socialization period (see socialization section below). ​Are you thinking about getting a new puppy ? Take a minute (or eleven!) and watch this video, where I list a few things to consider when getting a puppy. Quick note: I did forget to talk about Canine Care such as veterinarian care, grooming, chiropractic care and more - all just as important as any of the other topics I mention in this video. 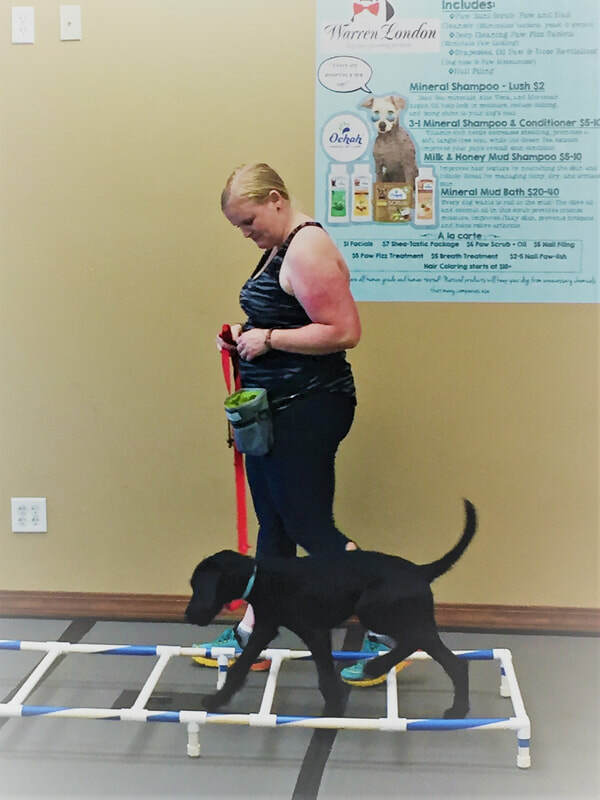 For Puppy Training Videos, click here to visit "Murphy's Training Page"
BEFORE You Get Your Puppy addresses your puppy's first three developmental deadlines: your doggy education; the search for and selection of a suitable puppy and how to assess its developmental status; and teaching household manners during your puppy's first week at home. The first three developmental deadlines are extremely urgent and crucial. AFTER You Get Your Puppy will focus on your puppy's next three developmental deadlines during the first three months your puppy is at home. The clock is still ticking, and you only have three months to get a lot of things done. 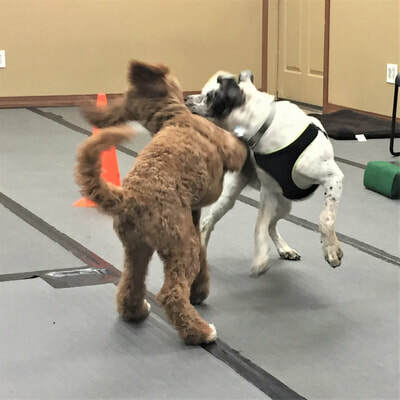 ​Quote from book: " The most urgent priority is to socialize your puppy to a wide variety of people, especially children, men, and strangers, before he is twelve weeks old. Well-socialized puppies grow up to be wonderful companions, whereas antisocial dogs are difficult, time-consuming, and potentially dangerous......"
" As a rule of thumb, your puppy needs to meet at least a hundred people before he is three months old...."
"The most important priority is that your puppy learns reliable bite inhibition and develop a soft mouth before he is eighteen weeks old. " As a rule of thumb, puppies should meet at least 100 people before the age of 16 weeks. But this should be an ongoing process for the first couple of years. And not only with focus on people, but also on new environments, surfaces, items and so on. 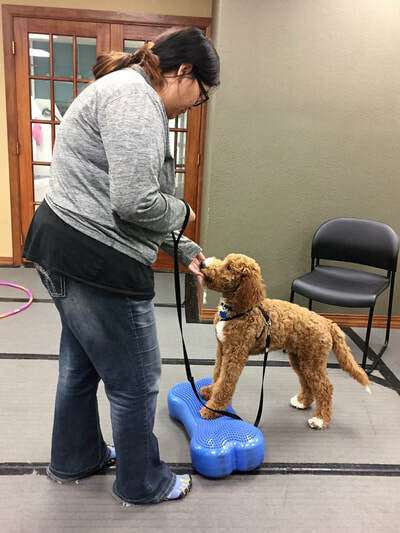 This socialization checklist is a great log to help inspire and remind you of the things and people your puppy needs to encounter. When talking about the importance of socialization, it is imperative to talk about proper socialization. 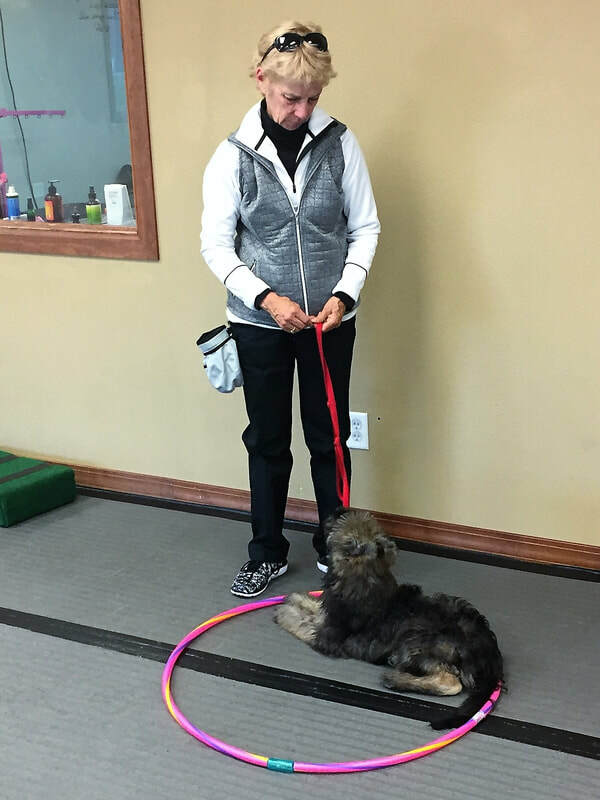 Laura VanArendonk Baugh wrote a great article, "Don't socialize the dog", where she talks about HOW to ensure you are helping your dog progress with new challenges , such as meeting new people or new objects. Quote:" Good socialization introduces a puppy or dog to something new, maybe even challenges the dog a little. 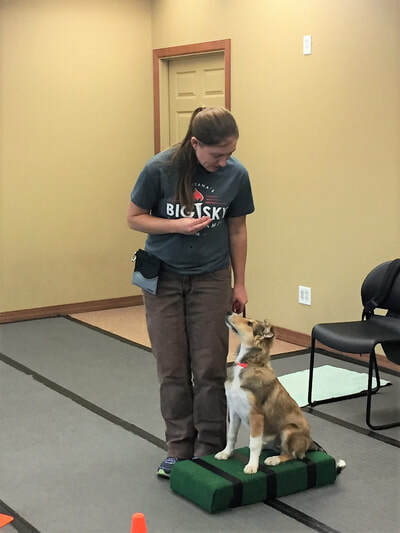 Good socialization provides a positive experience for the dog"......."But too often people think only of showing the puppy new things, without taking care that the puppy feels very successful. In fact, sometimes what people intend as helpful socialization creates more problems than it prevents." ​WE DO NOT ACCEPTS PUPPIES THAT GO TO DOG PARKS!! It is a safety and health concern ! UPDATE 2018: If you have a newly adopted dog from the Billings area or one of the Reservation Rescues, you will need to be up-to-date on Parvo/Distemper vaccinations and have had your dog for at least 2 weeks before attending one of our classes, private sessions or puppy play groups. 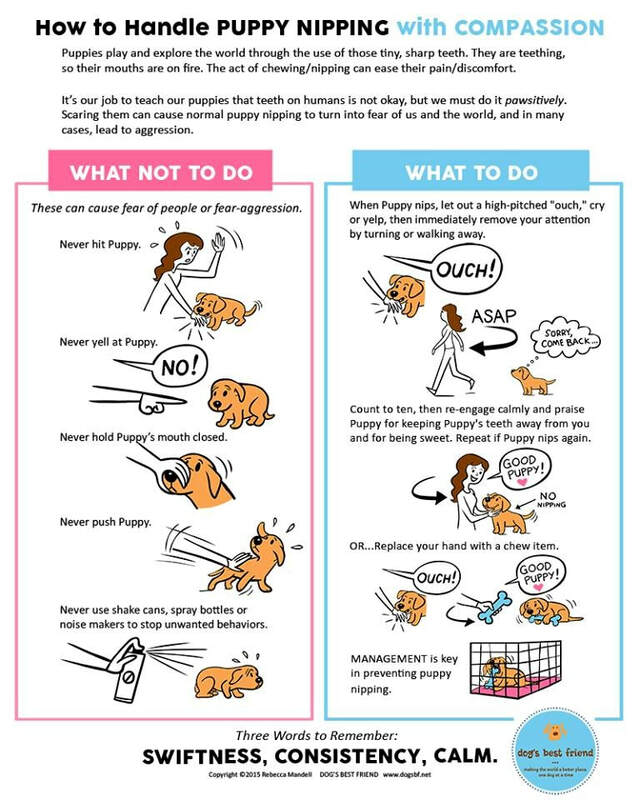 It is important that you learn to read your dog's body language, so you can take your puppy out of any situation that causes him/her (or you!) to feel discomfort or stressed. This video is full of great information about dog’s body language: calming signals, stress signals, anxiety and so on. Great resource which I highly recommend anybody to watch. Again, the more you know, the better you will be able to properly handle the situations you will encounter by "listening" to what your dog is telling you. 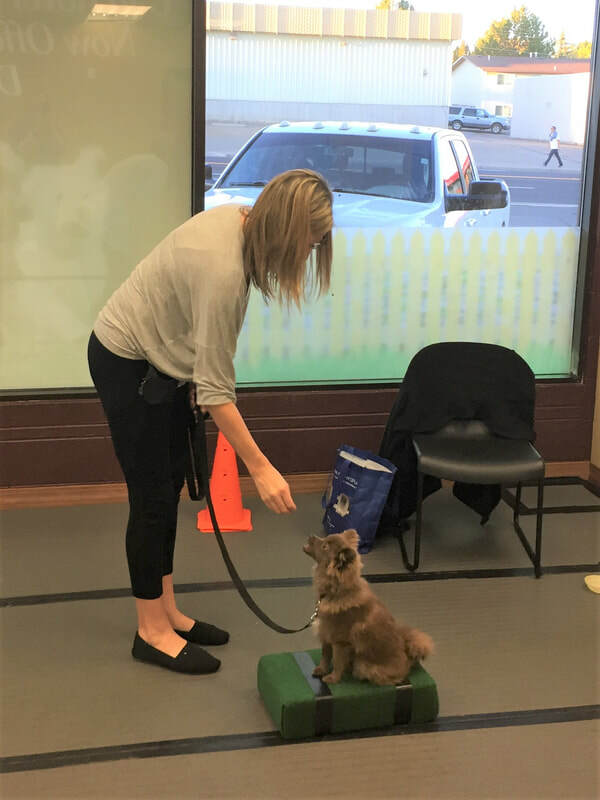 When observing stress signals in your dog, you can now prevent the stimulus around your puppy to trigger a negative reaction by simply walk away (add distance) and thus control the outcome a lot better and create positive memories. Being able to read your dog's body language is even more crucial to ensure appropriate play and interaction between your new puppy and your children. Supervision is always required and many breaks with child-free and dog-free zones are recommended. 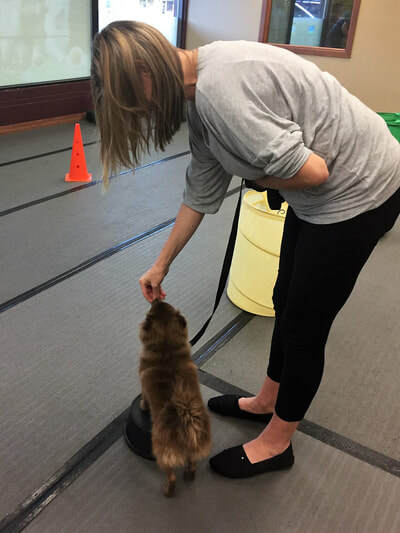 Colleen Pelar: Living with kids and dogs Colleen has written many books, and especially "Puppy Training for kids" is helpful when you want your children to interact and train the new puppy in the correct way. But it is important that you establish rules for your children when they CAN and CANNOT interact with the puppy. 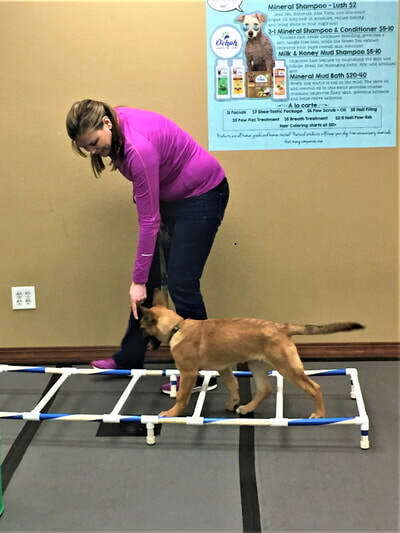 Our puppy package comes highly recommended and offers a combination of all the training options. Before coming to class, please start teaching your dog to "settle/relax om mat" (see this video). This is NOT a "go to mat" exercise, but instead simply teaching the dog that the mat is an awesome place, where great things (food, bones, stuffed Kong) will happen when he/she lays down to relax. 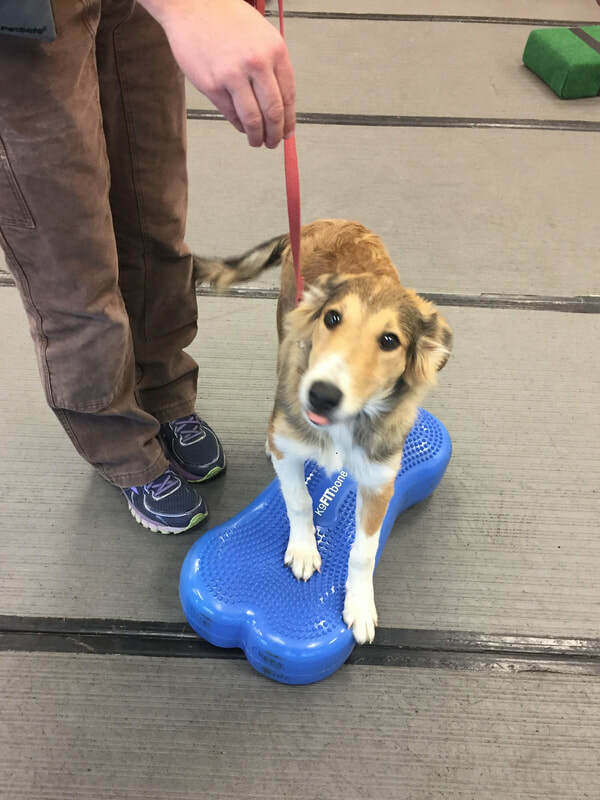 Focus on keeping your puppy's head down , since this posture will help your puppy relax faster - therefore licking is preferred in the beginning! 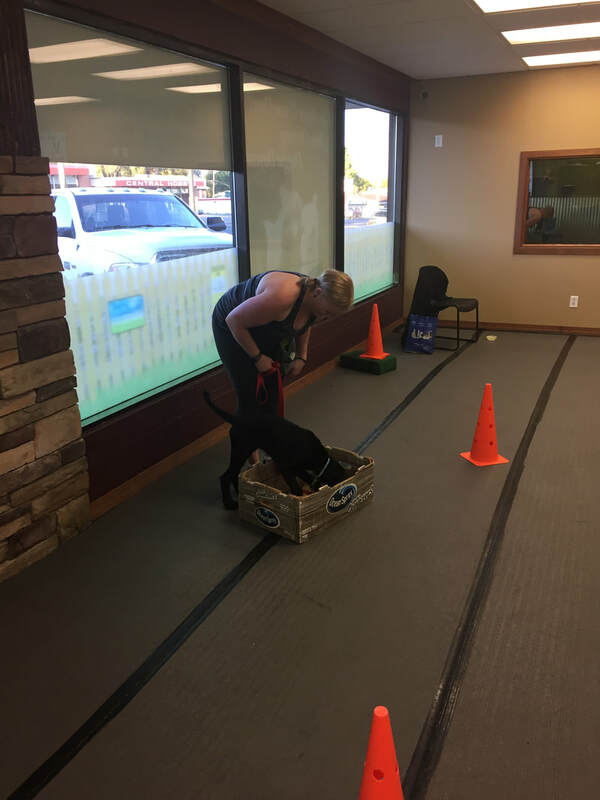 ​There’s no better time to start training than when you first bring your puppy home! No need to wait until vaccines are finished to begin your puppy’s education. It’s much easier to prevent problem behaviors now, then to fix them later! After completing this training plan your puppy and you will have a firm foundation to build on for the rest of his life. Regular price $538. Save $35 - only $504! I highly recommend this book. With over 400 photos, Dr. Yin explains step-by-step why puppies do what they do, how the environment and your training methods help form their personalities, and how quickly puppies can learn when you set them up for success. Why Start Training So Soon?